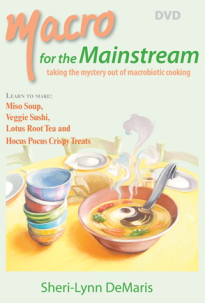 Partner with "Tea with Sheri" TV host Sheri -Lynn DeMaris in her quest to spread the word about the advantages of Macrobiotics. Sheri believes "your kitchen is your medicine cabinet." In this exciting DVD, she prepares easy to follow recipes using the highest quality whole, organic foods and offers step-by-step simple suggestions for improving one's health and the health of our planet.